If you haven't heard, I am getting married next Saturday, and I cannot believe it has finally arrived. 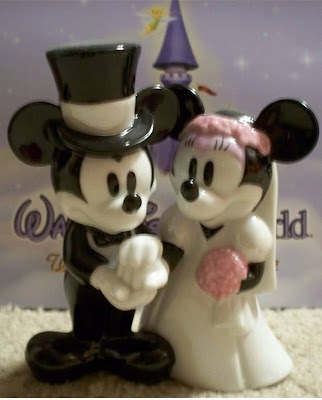 Later this week we’ll talk about how Disney-fied my wedding has become. Early on we made a conscious decision to keep my love of Disney under wraps during the course of our wedding weekend. However, like all good things, it couldn’t be kept down. This is our cake topper. Every time I see it, I am reminded of the cartoon, Mickey’s Nightmare. After Mickey has fallen asleep in this cartoon he dreams that he and Minnie get married. The hilarity that ensues revolved around the twenty-plus children they have. This is, to my knowledge, the only time that Mickey and Minnie have actually been presented as married (as themselves) on film. Here’s hoping that my cake topper isn’t a sign of things to come! My wedding was in May of 2017 and we had the same issue of keeping my love of all things Disney to a minimum. It was enough for me that I was able to convince my husband to go to WDW for our honeymoon. We had an amazing time!